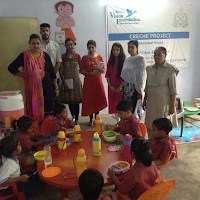 India Vision Foundation is an NGO based and headquartered in New Delhi. 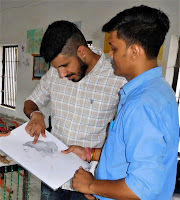 The organization is committed to rebuild the lives of the imprisoned and those whose families have a history of incarceration from Central Prison, Tihar Jail. The primary objective is to provide our target population with social skills, vocational training and ample opportunity, increasing their employability and enabling their smooth transition to becoming ‘mainstream’. We went to the Dasna (Ghaziabad). Dr. Poonam Singh ma’am accompanied us along with Mr. Ravi Sir to the prison. We met theSuperintendent of Dasna prison. He allowed us to enter the Male and Female wards as well.First, we went to the crèche inside the jail. 13 children are present there along with their mothers in the jail. We talked with them and they seemed to be happy. Then we went to the youth ward, we saw the barracks, went inside it and even interacted with these inmates. They actively take part in the activities conducted by the Foundation. They have a proper routine for the day which keeps them busy. They were encouraged by the IVF team present there and seem to have a positive response. We further went to see the female ward and met the Female warders and Mrs. Nazia who is IVF team member inside Dasnaprison. She showed us around the female ward, the barracks, activities performed by the women. 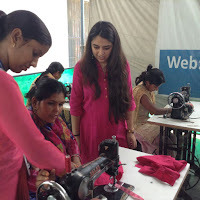 We got to see stitching classes in progress and women taking part in it enthusiastically. 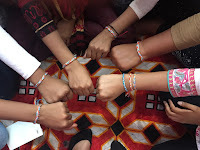 Teaching classes are also conducted where they teach women basics of stitching.Women, who are good at it, are transferred to the superior section of learning as their grasping power is more. We had an opportunity to interact with inmates about their past and how they want to change their lives now onwards in a positive way.The male ward is very different from the female ward. Number of male inmates is around 3500 and female is only 150 so male ward is bigger in size. Even the no of activities is more in the male ward. Like they had Dancing classes, painting, wall painting, art and craft etc.The inmates also showed a recent dance performance prepared by them. It was really good to see them dance. There is also stitching classes for men as well.Also, there was hair cutting class further we got to see the Library and the computer center. They are a lot of books present, but it is not used much by the inmates. The computer center allows them to learn basics of the computer and I saw them participating eagerly. All these activities make them busy during the day till 4 and then they can do whatever they want. There is also facility to play games like football, volleyball etc. This jail has also produced some very talented people who are very good in wall paintings. 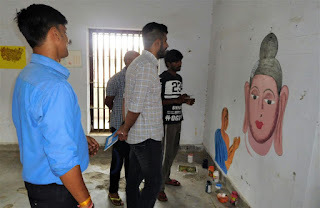 They are even hired to paint the jail walls and even female wards.As compared to the female wards, the male ward is on an edge as they have most of the facilities. The female does not have library, computer center, dance classes etc. but the IVF team present there is doing a wonderful job in keeping them busy and doing something productive otherwise the inmates maybe loitering around here and there. At least when they leave the jail, they know some skill which will help them strive in the society. It depends on the person whether he wants to reform/change. 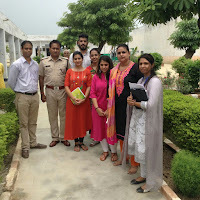 IVF foundation is just a medium to achieve it.After our Dasna visit we went to the Faridabad prison along with Dr. Poonam Singh. It is a very large jail having a lot of land. It is very spacious as compared to the Dasna prison. Also, at the entry of the jail, one can see beautiful paintings on the entry gate by inmates. We entered and met the Superintendent who gave us a brief about the jail. He then assigned a DSP who gave us a tour of the jail. It is spread across vast areas of land, it has a huge garden also. We first went to the activity center where there was a singing performance by inmates followed by a dance performance as well. 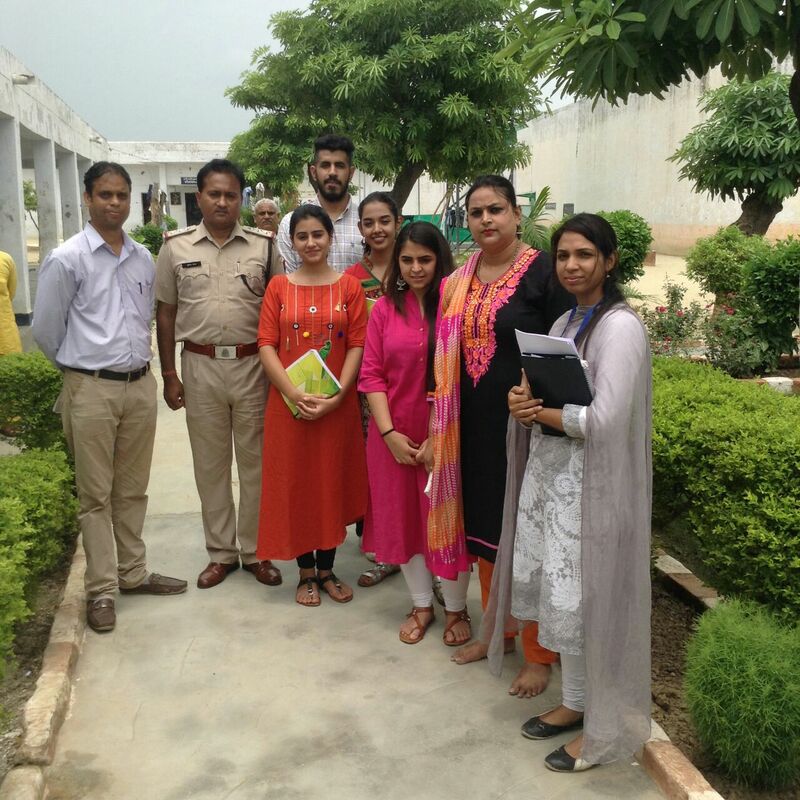 We also met the IVF team member there Mr. Govind who gave detail info about the jail and the inmates. We then proceeded towards the Factory section of the jail. There was steel wire production, fan repairing, ac servicing, mechanic classes, bolt manufacturing, watch making etc. There was also adult literacy class going on. We then went to see the women barracks. Here in Faridabad jail the no of female inmates is very less i.e. only 60 so there are not much activities here. But we saw stitching classes, beautician courses, and crèche inside the jail. They were very motivated by the IVF staff and jail admiration. It is a very well planned jail, with proper functioning. There are many reasons to that namely no of inmates is less as compared to Dasna. The police manpower is more here in Faridabad. We also got to see several paintings made by the inmates, it was truly very beautiful. Ever grateful to India Vision Foundation to give us an opportunity to watch closely “A journey of Re- Birth” - How lives transform within boundaries. An impeccable dedication with which India Vision Foundation in collaboration with authorities at Dasna & Faridabad District Prison are giving re-birth and shaping lives of inmates and transforming them with necessary skill sets, creating family atmosphere, looking after the children, so that when they step out, they contribute as responsible citizens.These inmates are given a platform to learn various things through a comprehensive 3 S Model approach (3S Sanskar - Value Education), Shiksha (Education), Skill - Training & Development).Both the jails are different in various aspects like location, staff, sanity, programs, etc. Dasna Jail of Ghaziabad,is a little congested and crowded.A barrack with a space of 50 inmates occupies 65 inmates. In the case of misbehaviour, the inmates are put in segregated cells. 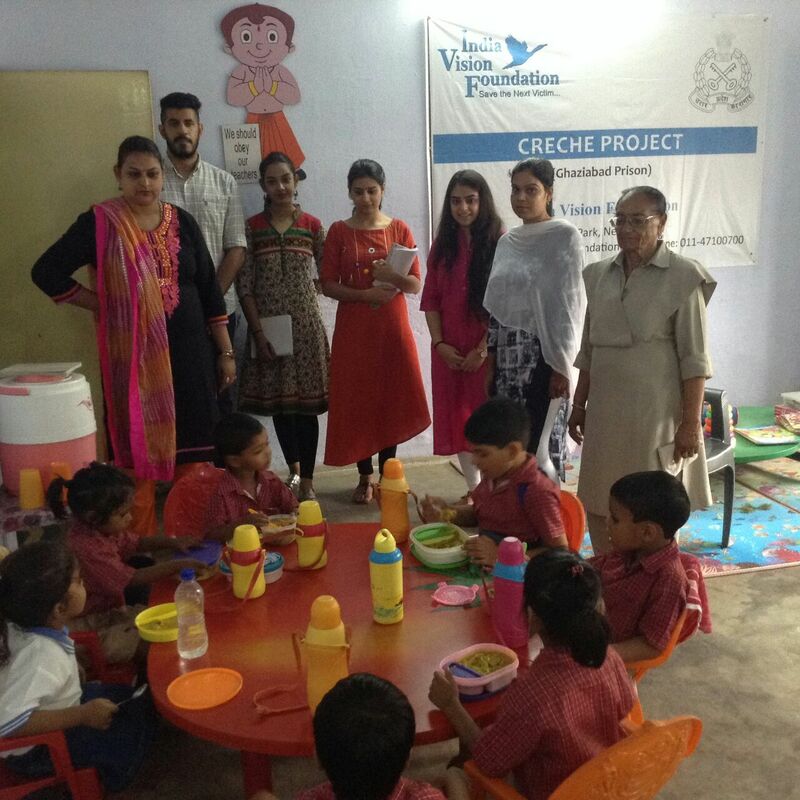 Having seen crèches, where children of inmates are given a healthy lifestyle, Learning from the pre-school education provided to them by the coordinators from the IVF team. We were overwhelmed to witness their morning prayers and going through their scrapbook & artbook gave us immense joy.The number of female inmates is more in Dasna is more than Faridabad. 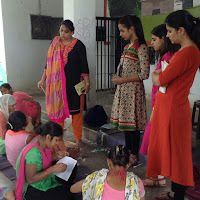 IVF in collaboration with both the jail authorities provide inmates with library, yoga classes, everyday prayers, mehendi classes, painting classes, dancing classes, singing classes, craftwork, engineering work, furniture work and with basic & adult education.All the jail facilities that are available for the inmates are only open for access on payment. Also, inmates work &earn money inside prison. The well-lit and ventilated Faridabad district jail is a huge property that provides a peaceful atmosphere for the prisoners. Female ratio is less in comparison to the male. Both the Jails are entirely different in respect to culture. The inmates performed bhangda (Punjabi dance), Sang along with music & drums, showed us their beautiful paintings and wooden clocks. There is a stitching cell that fixes cloths of the inmates. All the fans inside prisons are made by the inmates itself. In case of servicing and failing to function, the fans go back to the activity centre and the inmates fix it. To my physical observation - The prisons now days are styled as correctional institutions rather than as an institution for punishment. With evolution of the society and the increasing importance of human rights we have moved into an era of reformation from the era retribution.The main objective of the prison is to covert the inmates into ordinary members of the society by promoting them useful skills, education & respect for law which is very well executed by the prison project managers & coordinators of India Vision Foundation in Dasna& Faridabad jail.